DAYTONA BEACH, FL - A two-run home run from Jose Miranda off LHP Packy Naughton broke a scoreless tie in the bottom of the sixth inning on Friday night in the Miracle's 3-1 victory over the Tortugas at Hammond Stadium at CenturyLink Sports Complex. The Tortugas finished 2-for-9 with runners in scoring position and went 0-for-3 with the bags full as they stranded nine on-base in the loss. After Naughton retired the first two in the sixth, Alex Kirilloff extended the frame with a single to right. Two pitches later, Miranda hit a two-run blast down the left field line to but the Miracle on the board, 2-0. Caleb Hamilton reached on an infield single to start the seventh, stole second, and came into scoe on a two-out RBI single from Travis Blankenhorn to run the lead to 3-0. Alfredo Rodriguez reached to start the top of the eighth on a dropped third strike. He moved to second after Stuart Fairchild was hit by a LHP Jovani Moran pitch, and scored on a Taylor Trammell RBI single to round out the scoring at 3-1. In the eighth, Daytona would load the bases with one out, but Moran struck out both Ibandel Isabel and Bruce Yari swinging to get himself out of the threat. LHP Charlie Barnes (1-0) gets the win after allowing seven hits over 6 ⅔ shutout innings with a walk and five strikeouts. Naughton (0-1) takes the loss in his Tortuga debut. He allowed three runs on nine hits in seven innings with a walk and three strikeouts. Moran earned the save after allowing a hit, an unearned run, and a walk in 2 ⅓ innings with six strikeouts. 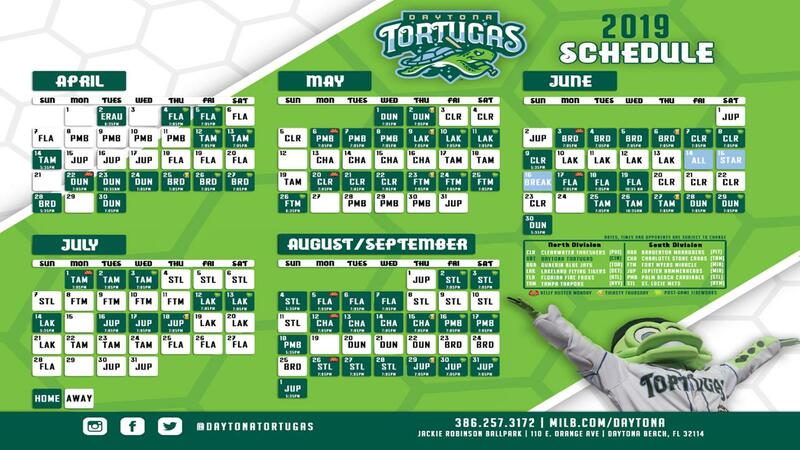 LHP Kevin Canelon (0-2, 2.94) will start Saturday night for the Tortugas. Canelon had a 1.42 ERA in six starts this season. Griffin Jax (3-4, 3.70) will go for the Miracle. First pitch Saturday is scheduled for 7:00 PM with coverage beginning at 6:45 PM with the Metcare Pregame Show on AM 1230, AM 1490, and FM 106.9 WSBB. NOTES: The Tortugas have trailed by at least three runs in all four of their playoff games… Packy Naughton induced an inning ending double play in each of the first three innings... Michael Beltre pinch-ran for the second straight night… Courtney Hawkins went 2-for-4 tonight. He is 7-for-15 in the playoffs… Brantley Bell finished 2-for-4. Taylor Trammell drove in the Tortugas only run, he has a team high 5 postseason RBI's… RHP Brian Hunter has retired 9-of-10 batters he's faced in the postseason, the only one that reached was on an error.